Wellington, PEI (September 5, 2012) – The focus of the 9th Annual Co-op Members’ Appreciation Tent Party, held on August 25th in the Wellington Co-op parking lot, was definitely on today’s youth and their talents since they represent the future of the co-operative movement. A highlight of this year’s party was the “Co-op’s Got Talent” contest, which featured 10 young acts competing for three top prizes. Ten-year-old Alecia Arsenault of Summerside grabbed first prize, $100, with her stunning rendition of Adele’s Rolling In The Deep. That performance also earned her a non-competitive guest spot at the Amazing Talent Contest, held on August 30th during the Evangeline Area Agricultural Exhibition and Acadian Festival. 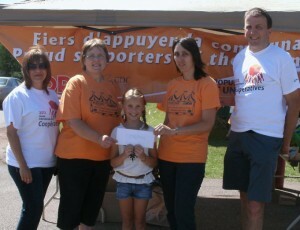 The young dance troupe, Les Pieds Rythmés from Summerside, made up of Bryanna Sharkey, Loren Enman and Renée Gardiner, shared the $50 second prize. Fourteen-year-old pianist-singer Rachel Brown from Bayside earned the $25 third prize. 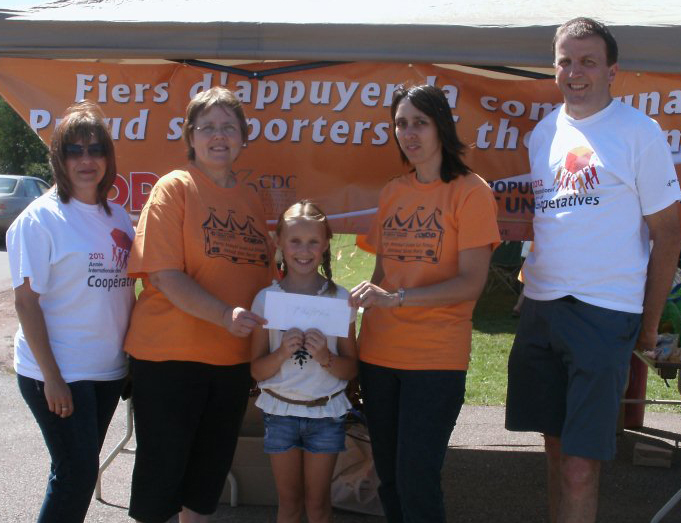 The tent party was organized and hosted by co-operative partners Évangéline-Central Credit Union, Wellington Co-op, The Co-operators and Le Conseil de développement coopératif de l’Î.-P.É., along with RDÉE Prince Edward Island. This fun day, whose official theme was the International Year of Co-ops, once again featured lots of activities for the whole family. Those in attendance enjoyed free barbecued hotdogs, refreshments and cupcakes. Free activities included an inflatable bouncer, noise makers and tattoos for the kids, as well as musical entertainment by Adrienne Gallant, Zakary Cormier and Alex Arsenault, Albert Arsenault and Julie Savoie and the trio Ten Strings and a Goat Skin. Participants from the Young Millionaires program were also in attendance to promote and sell their products and services.